he tech industry has been forced to change in dramatic and awe-inspiring ways over the past several years, with major corporations turning on dimes to accommodate major shifts and a constant stream of new startups striving to make an impact in the world. But on the other end of the spectrum, it would seem, is the restaurant industry, which on the surface hasn’t changed much at all. People still need to eat. Restaurants still rely on basic, older technologies like stoves and unchanged ingredients like fruits and vegetables to produce elaborate meals, and the “typical” restaurant system hasn’t changed much in the past two decades. Revel Systems recently shared some key takeaways from the National Restaurant Association (NRA) Show in Chicago — one of which being that the restaurant is overdue for some massive change. The restaurant industry isn’t entirely stagnant. Many restaurants have taken advantage of the latest advancements in technology to give their patrons a better overall experience. For example, most restaurants now feature online menus, online ordering and online reservations; some even have mobile apps so you can order your food for pickup while you’re on the go. But for restaurants to survive in years to come, they’ll have to take their in-house experiences to the next level. Over the past several decades, we’ve slowly moved away from using cash as a central currency to using credit cards and other “plastic” forms of payment. Today’s consumers need even more integrated forms of payment, as they’re becoming increasingly reliant on digital systems like PayPal and Apple Pay to handle their transactions. Soon, restaurants will need to integrate these payment methods—maybe even through online ordering—to accommodate these users. 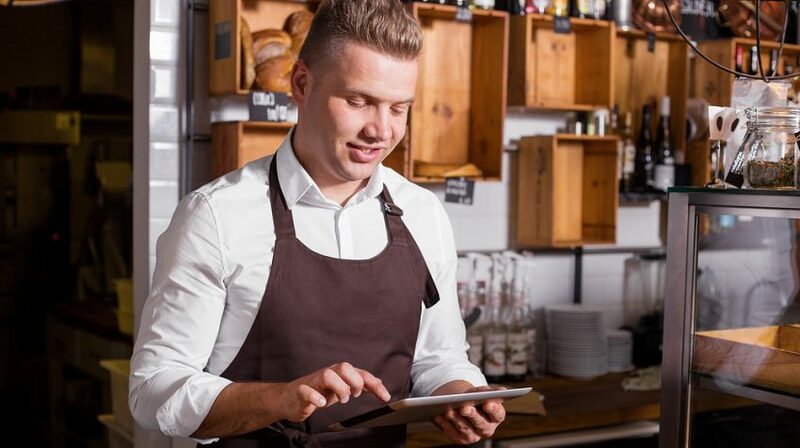 Point-of-sale technology is going to play a major role in every restaurant experience in the future, and may be an easy way to integrate new forms of payments. POS technology is essentially a more advanced cash register system. Depending on your specifications and the nature of your tech, you could set up a tablet for a customer to use when ordering and paying. These types of technologies make the transaction easier for both the customer and the employee, ultimately leading to a smoother and more manageable transaction. We’re still a few generations away from the entire restaurant experience being automated. However, certain processes will need to be automated in the near future to improve speed and quality of service and to cut costs for restaurateurs. For example, automatic ordering systems could trigger some mechanical processes to begin prep work, such as pre-heating an oven or preparing certain ingredients for a chef in the back. Eventually, these automated components could evolve into a much more sophisticated, comprehensive form. Another major point of consideration for restaurants is how to gather and interpret mass consumer data. With the right tools, restaurants could do a better job at capturing all kinds of consumer information, from the types of people who visit the restaurant, to the types of meals they order, how long they stay, and how satisfied they are when they leave at the end. All of this data could be highly meaningful — or completely meaningless — depending on how it’s gathered and used to improve the business in the future. Data visualization could be a significant boon here, especially for local restaurants and small businesses that don’t have access to the resources that national chains do. It’s also not only possible, but likely that consumers will start requesting and/or expecting more technologically integrated dining experiences. Today, it’s common to find televisions in the dining areas of restaurants — the next phase of evolution is improving user interaction at the actual tables. Ordering from the table, choosing music, adjusting atmospheric conditions, and making special requests could all be handled remotely in this way — and that’s just for starters. Thankfully, the technology and restaurant industries seem to be co-evolving. New tech startups are emerging to target the problems of the restaurant industry specifically, and as more restaurants adopt them, even cheaper, faster, better tech will emerge to compete for that market. The key for restaurants is to stay cognizant of changes in tech availability as well as consumer preferences, and possibly stay one step ahead of the competition while doing so.